“Pin-holes” in copper pipe or tubing is an old problem…There is, however, a new way to deal with this costly and bothersome problem…Copper Knight LLC deals with this “pin-hole dilemma” by using a very old, but very effective method of protecting metals from corrosion. This tried-and-true method is known as “cathodic protection”. Cathodic Protection uses a “sacrificial anode” to control the corrosion process in many kinds of metals. In plumbing, the most common application of this method is the use of an anode inside domestic and commercial water heaters. It works so well, that virtually every water heater manufactured in this country has one. Copper Knight LLC applies this old technology in a new and unique manner. Instead of protecting the internal surfaces of a water heater, it protects the entire internal surface of the copper piping system. 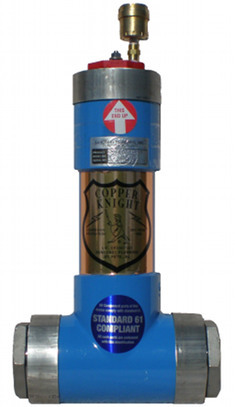 Copper Knight LLC has been designed and manufactured by a master plumber with more than 35 years of experience in dealing with the never-ending succession of “pin-hole leaks” caused by internal pipe corrosion. Copper Knight LLC is manufactured to very high standards, and will give a lifetime of service and satisfaction if properly installed and maintained. It is manufactured in seven (7) basic sizes, and are sized for the intended application, from single dwellings to medium or large condos, as well as commercial and industrial needs. 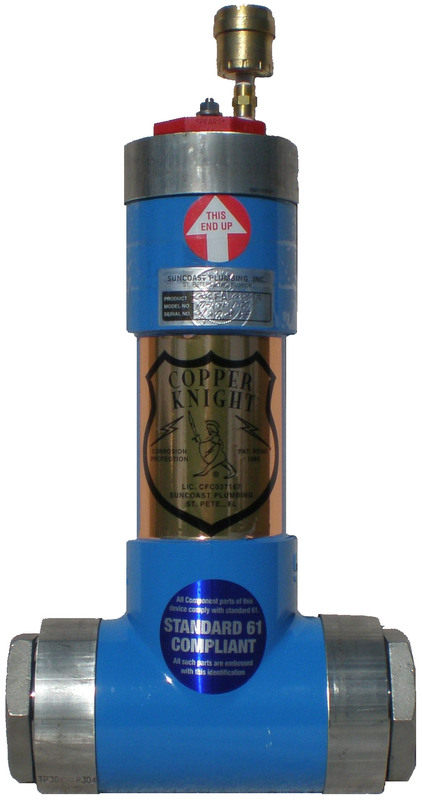 Copper Knight LLC makes no claim to rejuvenate old existing copper lines, it does however guarantee to inhibit further damage to piping, and greatly increase the serviceable life of all copper components within the piping system.